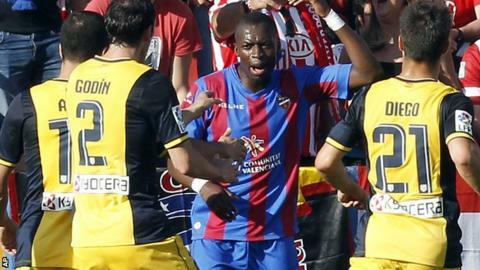 Levante midfielder Papakouly Diop said he was responding to monkey chants from the crowd when he danced in front of Atletico Madrid fans after his side's 2-0 win over the La Liga leaders. Diop provoked outrage among Atletico players by dancing in front of travelling fans after a game that threatens the Madrid side's title bid. "I was going to take a corner and some of the Atletico fans started making monkey chants," said the Senegalese. "To defuse the situation I danced." The incident comes a week after Barcelona's Dani Alves ate a banana thrown at him by a fan during a La Liga game against Villareal. Alves's action prompted an international anti-racism campaign across social media, apparently planned in advance by Brazil and Barca team-mate Neymar. Diop, who has played in Spain since 2008, said his dance was not intended to goad Atletico fans after their unexpected defeat, but that he was responding to monkey chants aimed at him as he took a corner in stoppage time. "I have nothing against the Atletico fans because it was only a section who chanted," he said. "It's a lack of respect you get at all stadiums. It's a provocation. I don't know if you can call it racism but these monkey chants have to stop." Match of the Day presenter and former England striker Gary Lineker, who had a spell at Barcelona, tweeted: "Spanish football must face up to the fact that they have a serious racist problem. They can't continue to bury their heads in the sand."